45 Horizon View is a 2nd Floor 2 Bedroom 2 Bathroom Modern Seafront Apartment. It is all on a single level. The 25 foot Balcony and Floor to Ceiling Sliding Doors to Lounge and Master Bedroom provide 180 Degrees Stunning Sea Views. Only a few metres from the Blue Flag Sandy Beach which is popular with Holidaymakers and Surfers alike. There are Stairs and Lift to all floors and Secure Underground Allocated Parking is provided for 1 car with additional visitor parking at ground level. WIFI via Superfast BROADBAND is provided throughout the apartment. Westward Ho! is a popular traditional seaside village which has seen significant investment over the last few years. Ideally located to explore North Devon, the village has restaurants, cafes, bars, takeaways, supermarkets and local shops together with plenty of holiday activities from relaxing on the beach through surfing, walking, rock-pooling, go-carting, crazy golf and amusement arcades. The apartment is fully furnished with leather and oak in the main living areas. For 2016 we have installed a new leather corner suite with seating for five. There is an oak dining table and four chairs. The kitchen has granite worktops and a full range of integrated appliances. The master bedroom has a king size bed (5 feet wide) and en-suite bathroom whilst the twin bedroom has two single beds (each is 3 feet wide). In addition there is a separate shower room with a walk in shower. Gas central heating means that the apartment makes a great base for a holiday at any time of the year. Please note that the master bedroom has been installed with a new king size bed (5 feet wide) with a brand new 1500 pocket spring mattress. For an additional fee of £25.00 payable to the owners, a property manager can provide a 'Meet and Greet' service on arrival. She lives in the village, and has a good knowledge of the local area. What makes this apartment unique Rarely found, this modern apartment is on the seafront with uninterrupted views over the beach and sea. It is a single storey apartment with lift access making it suitable for all ages. In the past many guests ranging from families with small children through to more mature guests have enjoyed holidays in this apartment. Furnished to a high standard it provides a home from home atmosphere. The secure underground car park and video entry system mean that our guests can fully relax during their stay. Last but no means least - Tea on the Green is only 100 metres away! We fell in love with this property because of the wonderful views of the ocean and magnificent sun sets. The balcony has superb vantage to enjoy these views and is one of the largest in the complex, making alfresco drinks and dining a must. 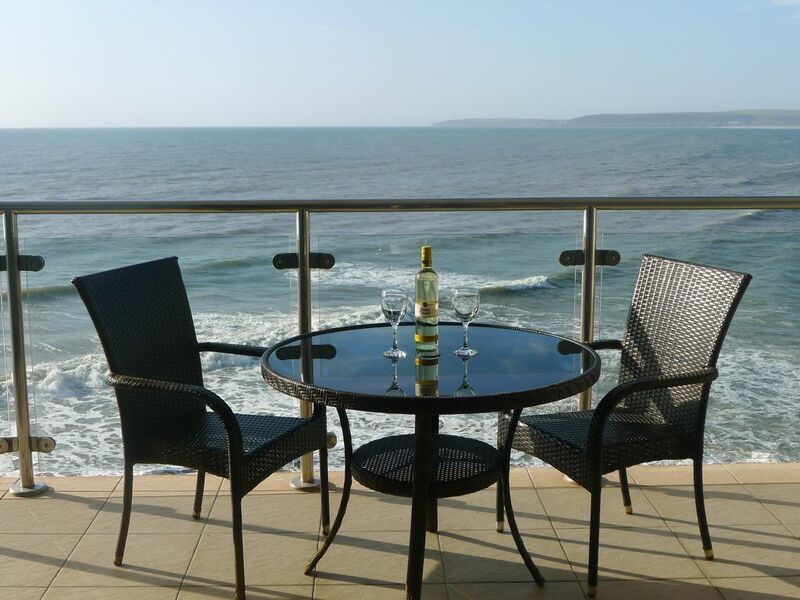 The large en suite master bedroom is situated right next to the balcony and what ever the weather it is wonderful to lie in bed and watch the waves roll in and listen to the ocean and bird sounds.The apartment is light and spacious and extremely comfortable. As 'back sufferers' we have purchased good quality supportive furniture and matresses to make relaxing and enjoying the magnificent views even more enjoyable! It is a Luxury Apartment! A beautifully appointed apartment with sea views from the living room and bedroom. We couldn't have asked for anything better in Westward Ho!. Comfortable beds, great kitchen to cook in and plenty of space to move around in. It was a memorable experience for us. Amazing views especially waking up in the morning to see the tide going out. Don’t forget to pack binoculars the wildlife is amazing.The apartment has everything you need and more and provides a great touring base. This was our second time at this apartment, and it was just as good. Firstly communication with Sandra the lady who will greet you with the keys and show you up was excellent l . The apartment was spotless and very comfortable. You could not get a better location. Even though the weather wasn’t as great as last time we managed to sit on the balcony for morning coffee. It’s great just to sit and watch the surfers out on the water. Westward ho! It’s a lovely area just to come and chill out in. Places to eat and drink. Couple of gifts shops, arcade. We did a nice walk from the apartment to the Thatched inn, where we had a great car very .. . We have booked several properties through home and away and they have all been excellent. We have never had any problems with the booking process and found it to be easy. Would recommend this to anyone. This lovely apartment is in a great location. It is directly on the seafront with everything you need within a couple of minutes walk. The apartment is very well equipped, we ate out in the evenings but had I wanted to cook a meal the pots and pans and utensils were all there, I managed to resist that urge though!! The apartment was presented beautifully and was very clean. It's helpful to have bath and hand towels provided. The view from the lounge and master bedroom is fantastic! We watched several lovely sunsets from the balcony! It's handy having recordable freeview on the tv, and brilliant having hair dryers provided. The building was quiet and well kept and felt very safe with the security system. The green next to the building is surrounded by good little shops and eating places. For nice gifts and momentos the artisan shop Everything Westward Ho! is very good, they stock products from local artists and producers. Our son and daughter highly recommend So Sweet, which do a good range of sweets, British and American. The Tea on the Green cafe is definitely worth several visits! Golden Fry do very good fish and chips, they get quite busy but if there's a long queue you can just about see from the balcony and leave it 15 minutes. We had a take away from Moran's Thai restaurant, which was very nice and we eat at The Beach Diner which is just across the road from the apartment. Our favourite restaurant is The Pier House, Sunday carvery there is delicious, it was so nice we booked to go there on our last evening too. There are several little supermarkets nearby, Co-Op, Tesco Express and Londis. We made good use of the free tennis courts and played mini golf and some of us went Go-Karting (£4:50 each) We spent many hours strolling along the beach, paddling, watching the surfers and trying to fly our kite. This apartment would always be our first choice when planning a stay in Westward Ho! Loved this place. Well equipped, comfortable, breathtaking views, lovely setting, cant say enough great things about this apartment. Underground car park very useful for leaving all your equipment, like surf boards, nets, bikes, etc. Lovely part of Devon, would highly recommend this place. Westward Ho! is a traditional holiday village which has seen significant investment over the last few years. It has a 2 mile long Blue Flag beach, a village green, three small supermarkets and a range of village shops as well as holiday amenities such as crazy golf, go karts, amusement arcades and other children attractions. Surfing is a popular activity in Westward Ho! with surf centres and shops in the village. For walkers there is the sandy beach and the Southwest costal path passes directly in front of Horizon View. For cyclists, the Tarka Trail runs from Torrington to Barnstaple via Bideford and cycle hire is available at various points. Exploring the rock pools on the beach for crabs and small fish is extremely popular with families. There is a good range of restaurants, cafes, bars and takeaways within a short walk. These include Morans Thai Restaurant, Tea on the Green (winner of Best North Devon Tea Rooms), Rock Pool Café (which is great for breakfast and lunch), Country Cousins (excellent Sunday lunch) and The Pier House (fantastic sea views). A Hockings ice cream van is normally parked near the village green meaning that a locally made ice cream is close to hand. Within a 10 to 15 minute drive are popular holiday attractions The Big Sheep, The Milky Way, and Clovelly. Within 30 minutes are RHS Rosemoor Gardens, Dartington Crystal and Barnstaple. Bideford is the nearest town - less than a 10 minute drive. From Bideford (or Ilfracombe) it is possible to take a day trip to Lundy Island which is three and a half miles long and a half mile wide. It is vehicle free and famous for its sea birds. Great for walking and fantastic views. For serious shoppers, Atlantic Village is a small outlet centre (including a larger supermarket) only 3 miles away and Barnstaple provides an extensive range of High Street names and individual shops. If you don't want to drive, a frequent bus service will take you to Bideford and Barnstaple. From Barnstaple you can get a train to Exeter. In the apartment there is a welcome book providing further details of places to go as well as a basket with maps and leaflets for the main attractions.